Another of New Zealand’s ‘living dinosaurs’, the giant weta, has returned to the mainland after a century of extinction and survival only on predator-free islands. One of the world’s heaviest insects, growing to the size of a mouse, the Cook Strait giant weta (Deinacrida rugosa) is the 15th native species to find a protected home in Wellington’s Karori Wildlife Sanctuary. On 11 February the first contingent of the spiky, scary, but gentle relatives of the more aggressive common wetas. Everyone hates to find them in their gumboots. They are brought from Matiu-Somes Island in the harbour to the refuge, but local Maori welcome them. No Fear! Ben Gordon of Wellington gets down into the forest with one of the just-released giant weta being re-introduced to the mainland in Karori Wildlife Sanctuary. This is the first attempt to bring back the gentle giants that predators banished to safe islands 100 years ago. Wellington Central MP Marian Hobbs, a former environment and biosecurity minister, also welcomed the weta, but with a bit less personal enthusiasm. Ms Hobbs is famous to have an aversion to creepy-crawlies. She seemed relieved the critters would not only be safe inside the predator-proof fence around the world-first sanctuary. A leader in not just preservation but wildlife restoration, even though they would also be locked IN. This is the first attempt to re-establish the species since its decimation on the main islands a hundred years ago by introduced predators. It is the first of four transfers of up to 450 wetas over four years. They are all from Matiu-Somes and Mana Islands. These species are usually at around 70mm long, and weighing up to 27g. Their mouse-size makes them one of the world’s heaviest, and, for many, the stuff of nightmares. But Deinacrida rugosa are gentle giants – non-biting herbivores far less ferocious than the smaller tree weta which bites. “The giant weta is a living icon of New Zealand,” said Sanctuary head Nancy McIntosh-Ward. “They have been around for over 190 million years and are as unique to our landscape as kiwi and tuatara.” The sanctuary recently had a release of tuatara there. This can look like basking in the sun along the footpath on which carrying the Wetas to their new homes. Twenty giant wetas have radios to monitor their movements, a first use of transmitters to track weta as part of a species transfer. The weta should breed, and indeed a pair was discovered mating already before their release. Males and females were released near each other in widely spaced locations. Wetas get their name from Wetapunga – the Maori god of ugly things. There are 11 species of giant weta found in NZ, and Deinacrida rugosa is by no means the largest. 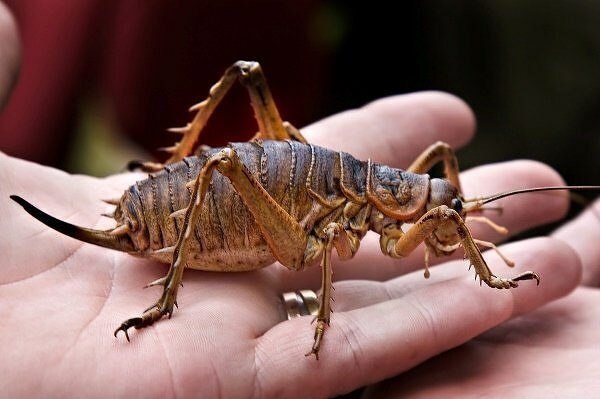 A giant weta was found on Little Barrier Island and the weight of it at over 70g. Members of this family are also found in South Africa, Australia and South America. But our weta is by far the largest and most diverse. The weta has over 70 species, and new species are still under research. Ms Hobbs and the other dignitaries trudged up the paths carrying their cat-boxes of wetas. The releases slowly began, with Ms Hobbs continuing to keep her distance. But something strange happened; perhaps the urgings of the pack of photographers and cameramen. However, Ms Hobbs suddenly found herself with a double-handful of giant female weta. As she quickly knelt to release it, she had to hold it for the cameras far longer than she wished. But finally, her grimace turned to a smile that seemed genuine, and not just for the cameras.